There is a confusion surrounding the International Maritime Organisation's 2020 global sulphur cap and it isn't coming from the IMO. It's all clear what the cap will mean, what it will entail and who it will benefit. The trouble is, in the slow paced 'rush' to accept the cap, many ship owners, operators and managers are perhaps failing to appreciate that preparations for accepting any new compliant fuels should start in 2019 and not at zero hour 2020! Aderco, one of the world's leading fuel treatment suppliers, has been recommending to its customers since the end of 2017 that tank cleaning needs to start no later than June 2019 to ensure they do not fall foul of the new regulations. This is the most pressing task before any new fuel blends can be introduced into their tanks and using a fuel treatment is the easiest, most cost effective and assured way of keeping a ship at sea and completing this vital task. The IMO's Marine Environment Protection Committee (MEPC) will discuss proposals from Norway at their 73rd session in October covering implementation plans for ships to be developed according to an agreed IMO guidance and robust enough to ensure compliance by 1 January 2020. Among the proposals are for vessels to have a log of actions taken that records the first loading of compliant fuel, the fuel tank cleaning process and assessments of the new fuels on engines and machinery. This is not a task that can be adequately handled just a month before the first compliant bunkered fuel is taken on-board. "There is little point in taking on compliant fuel if the tanks have not been flushed and cleaned. Cross-contamination is as serious as the issue of protecting maritime diesel engines from cat fine issues, contamination, sludge development and corrosion. Fuel treatment can offer operators protection from these incidences and can be used to flush and clean tanks which ideally needs to be starting in June 2019." The switch from heavy fuel oil (HFO) to low sulphur fuel comes with its own issues: tank contamination can result in non-compliance and a reduction in engine performance as well as corrosion concerns. Even a fraction of heavy fuel oil in the tank will be a contaminant: tanks that have carried HFO for many years will have HFO residues and since they are a good solvent, even once cleaned, the tank may have remains of the HFO that will create problems at a later stage. Tank cleaning needs to be carried out more comprehensively than probably ever before. Enforcement is currently dealt with through in-port verification of bunker fuel sulphur levels along with monitoring of smokestack emissions at sea using airplanes and drones. But the open seas present a wider challenge and the suggestions of 'sniffers' on the bridge and black-boxes continue to be discussed. Suggestions that 'cheating' and non-compliance by some ships could be rife during the first few months of the cap seem a little wide of the mark. After all, it beholds the industry to show that it is environmentally conscious. What worries many in the shipping world is still the availability of compliant fuels. High viscosity sulphur fuel oil (HSFO) is based primarily on residual fuel oils and these tend to stick to the inside of fuel tanks forming layers of semi-solid substances: this results in sediments and asphaltenic sludge which will have solidified over time, not only in the main tanks, but also in pipelines, settling and service tanks. Cleaning this out requires a concerted effort either manually – risky, expensive and time-consuming – or with specialised fuel treatments. Tank cleaning without the use of treatments added will require docking or, according to some in the industry, by loading low sulphur fuel on top of existing fuel oil and gradually flushing the old fuel through the fuel system allowing the new fuel to act as a cleaner until the sulphur content in the ship's fuel system is compliant. 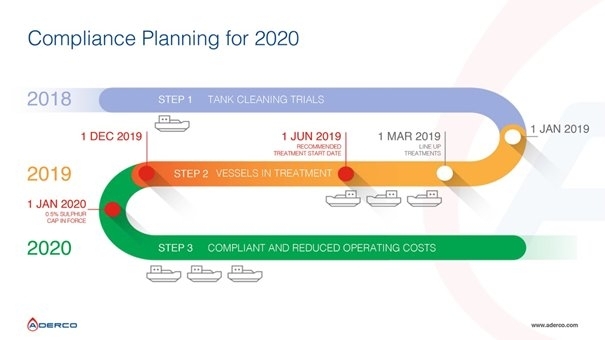 While at first this might be appealing to some ship owners, the risks are evident without the guarantee that the tanks are 100 per cent clean at the end of the process. Even the International Bunker Industry Association (IBIA) has said: "It is therefore not recommended to simply load compliant fuel directly into tanks previously used for HSFO or to start flushing through the fuel oil service system to achieve compliance, without taking preparatory and precautionary steps." There is also another perceived 'threat' from the new cap, namely, the proposals from Norway to be discussed in October also raises concern about the threat of extra and detailed Port State Control inspections covering compliance with the new cap. Without written ship implementation plans demonstrating the processes of securing and using new fuels, vessels without such plans could be subjected to more detailed inspections to verify compliance. There is a suggestion from some industry experts that some bunker suppliers may need a whole year to make changes in the supply chain to provide compliant fuels. While some wait around in dry-dock for scrubbers to be fitted or feel relaxed about their preparations for compliance, there is a whole lot more waiting for the imaginary starting gun to go off and for the first addition of a fuel treatment that will flush and clean their tanks. Compliance starts in the tank and the processes starts in a diary marked June 2019. 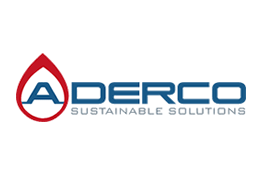 Founded in Canada in 1981, Aderco develops, manufactures and distributes specialised fuel treatments, including fuel conditioners and lubricity improvers. Aderco products are 100% vegetal-organic, 100% ashless and 100% metal-free. As such they set the benchmark for greater performance, efficiency and sustainability in fuel-powered operations in the marine/maritime, mining, power generation and transportation sectors worldwide. Aderco Ltd, based near Winchester in the UK, focuses on applications for the marine market in the UK as well as for industrial sectors in the UK and abroad. 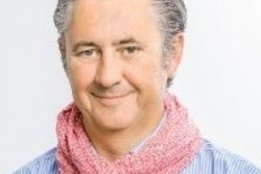 Aderco Pte. Ltd. Singapore spearheads the Group’s on and off-shore activities in the dynamic Asia/Pacific/Oceania region. Aderco Marine sprl is based in Waterloo, Belgium, and 100% dedicated to serving our customers in the global maritime market. All are wholly owned subsidiaries of Aderco International SA, the Group HQ located in Nyon, Switzerland. With a strategic presence in Athens, Dubai, Genoa, Houston, Limassol, Montreal, Genova, Sao Paulo, Conakry, Jakarta, Seoul, Singapore and Sydney and over 20 stock points across the globe for rapid response logistics, our customers can count on outstanding technical, sales and customer support. For more information, please visit www.aderco.com. Meanwhile, others suggest a price range for crude that both the U.S. and OPEC could live with.